What is FLIR IR Camera Player? • Option to compress the FLIR Researcher formats F7M0 and F7M2 to AVI. • Support for FLIR Exx series cameras. • Support for FLIR T6xx series cameras. 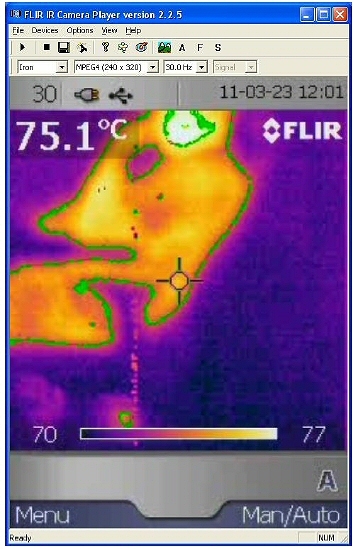 What can you do with FLIR IR Camera Player? • Record a video stream from the camera. • Save a frame from the video stream as a snapshot image (*.bmp). • Autofocus, focus far, and focus near. • Autoadjust the camera image. • Freeze the camera image.